3 Types of Newsletters: Which Should You Write? 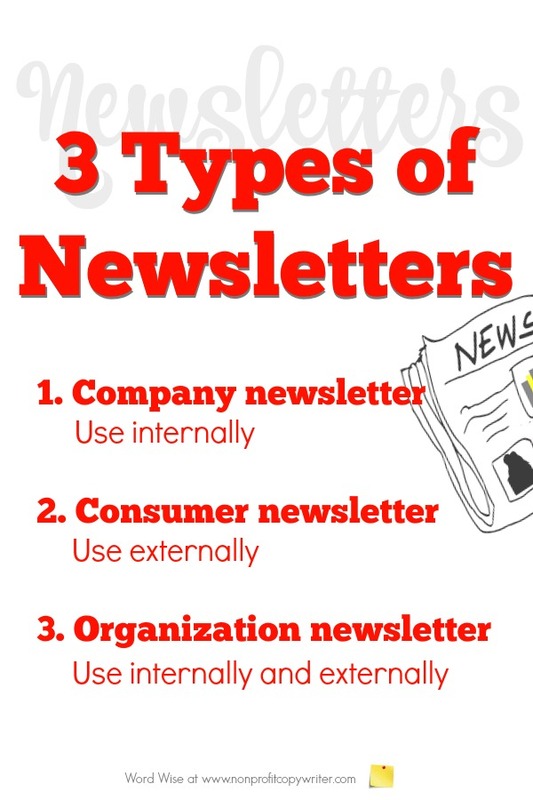 There are three types of newsletters: the company newsletter, the consumer newsletter, and the organization newsletter. Which one works for you? That depends. A newsletter is a publication that delivers content about a specific topic to a specific group of readers. It can vary in size, style, and frequency. If written well, a newsletter instructs and inspires. But a newsletter’s two distinguishing features are clear: its content is about a specific topic and for a specific readership. For that reason, a newsletter can be a powerful communication tool. To know which kind of newsletter works for you, ask yourself two questions. Your newsletter offers information about a single topic. For instance, an investment firm like Charles Schwab publishes a newsletter about personal finance for its investors. You’ll write to a targeted, qualified group which may include employees, members, businesses, partners, participants, fans, students – those with a special interest in the topic or a connection to the publisher. Your newsletter can be published for print, for online distribution, or both. An online version is sometimes called an “electronic newsletter,” “e-news” or “e-zine.” While there has been a long-held rule that a newsletter is to be published at regular intervals, that assumption has been discarded in the digital age. You determine how often a newsletter is published, whether it’s daily, weekly, monthly, annually, erratically, or even just once. You can know how to structure newsletter content when you define your topic and your readers. Use this internal communication to keep employees and staff informed and build morale. Updates about products, services, changes, achievements, policies, and opportunities – anything affecting those who work for your company – as well as profiles and human interest stories to cultivate team work. Employees, retirees, insiders. For example, a couple of times a year I receive Sempre Fi, a newsletter for retired U.S. Marines, which provides updates about retiree benefits and services. I didn’t subscribe. Rather, the USMC automatically adds each Marine to Sempre Fi’s mailing list upon retirement. Use this publication externally – to stay in touch with your customers, readers, users, and subscribers and keep them in your “family.” Most businesses, entrepreneurs, and sole proprietors choose this newsletter format. Past or current clients, customers, or consumers or those with an interest in the products and services you offer. A travel agency, for instance, may send a newsletter offering travel tips, upcoming offers, and feature stories from travelers using the agency’s services. Use this publication both internally and externally. Of the three types of newsletters, the organization newsletter is a unique blend that speaks to those in your inner operating circle (members, staff, employees, and board) as well as your consumers (donors, partners, readers, interested parties, and prospects.) Most nonprofits and ministries choose this newsletter format. Updates, information, features, tips, announcements, industry news -- anything that communicates your work and your cause and helps your readers. Current and past partners, donors, beneficiaries, insiders as well as those who may have an interest in your cause or be connected to your work in some way. A nonprofit organization newsletter offers feature stories and updates about those who are benefiting from your work, new initiatives, and upcoming events. A school newsletter keeps parents, teachers, and administrators informed about projects and activities. A church newsletter keeps members past and present informed about upcoming events and cultivates readers with helpful content. Your nonprofit ezine: why should readers subscribe? What are ezines and do I need to publish one?